I won’t start hiking along the PCT until mid-to-late April, but there’s already a lot to do to get ready. Mostly it’s: GEAR GEAR GEAR GEAR GEAR GEAR GEAR. Things can get pretty out of hand when preparing for a five to six month hike. People get really obsessive. I find the task of assembling gear for a thru-hike to be pretty tedious and so I’m procrastinating. 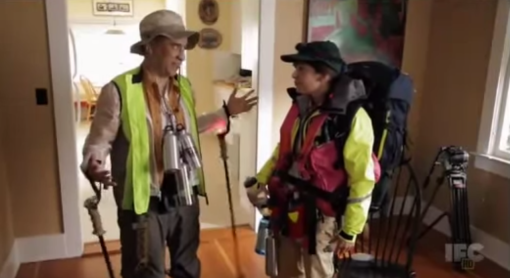 Seriously – watch the “Get The Gear” episode on Portlandia. This is what can happen. I can afford some procrastination with all this because I’ve already got the Big Three items that make up the bulk of a thru-hiker’s base weight, and the items that seemingly warrant an epic amount of late-night internet searches, detailed discussion on Facebook groups, and arguments among friends. The Big Three are: backpack, sleeping bag, and tent. If you have a heavy Big Three you’re just making life harder for yourself for no reason, so it does actually matter what choices you make here. My personal choices are listed as follows, and no, I don’t want to argue about their pro’s and con’s any more. Hyperlite Mountain Gear 2400 Southwest Backpack. This pack can fit 40 liters of stuff, weighs 1 lb 12oz, and was made in my very own Maine! I went to the factory in Biddeford to see the employees sewing the gear together and pick up my own pack. Western Mountaineering Ultralite 20 down sleeping bag. This weighs 1 lbs 12 oz. This is the same bag I’ve used on all previous backpacking trips for the past six years. I’ll need to wash it once or twice before I set out as some of the feathers have gotten dirty and are clumped up in the bottom of the bag. I might also buy a sleeping bag liner to use with this bag because I’m a cold sleeper and I’m worried that a bag with a 20 degree rating won’t cut the mustard on it’s own. ZPacks Hexamid Solo Tent. This weighs 15.4 oz. I’ll be adding 8 tent stakes, a a carbon-fiber tent pole (since I don’t hike with trekking poles), and a ground cloth made from Tyvek home wrap to this kit. Not sure what that will bring the total weight to, but as you can see it’s not heavy. Abby is an accomplished thru-hiker, wilderness guide, and environmental advocate. She hiked the Appalachian Trail in 2011, the John Muir Trail in 2012, the Wonderland Trail in 2013, and the Pacific Crest Trail in 2017. She lives, works, and explores in the Mountains of New Hampshire and the coast of Maine. She works as an environmental policy consultant as well as a backcountry ski guide, sea kayak guide, and hiking guide. Abby blogged for the Trek during her 158 day thru-hike of the PCT in 2017. What is the name of the feeling that is pride and excitement and and love all rolled up into a big dumb grin when you read something? I don’t know Matt but I have the same feelings and currently wearing the same dumb grin! Looking forward to each installment. Love the Big Three choices. Abby, you don’t know me from a load of hay, but your mother is my bff.